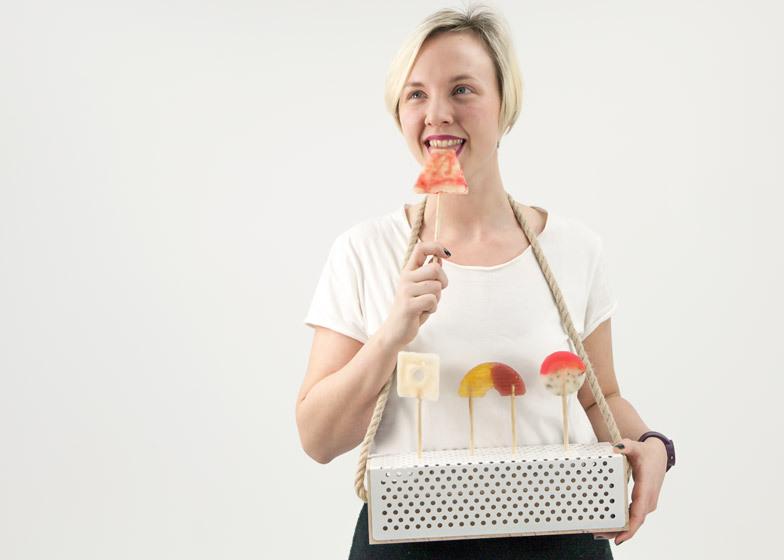 Dutch designer Tessa Geuze – a first-year Masters student on the Industrial Design course at Sweden's Lund University – presented the lollipop-making kit during Milan design week as a member of the The Tomorrow Collective. 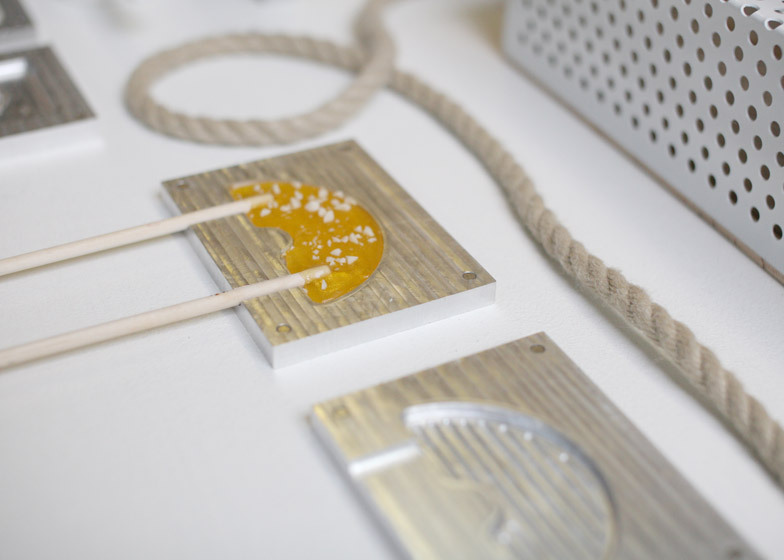 The group of students showed a range of products and tools "inspired by past knowledge of how to grow, make and be". 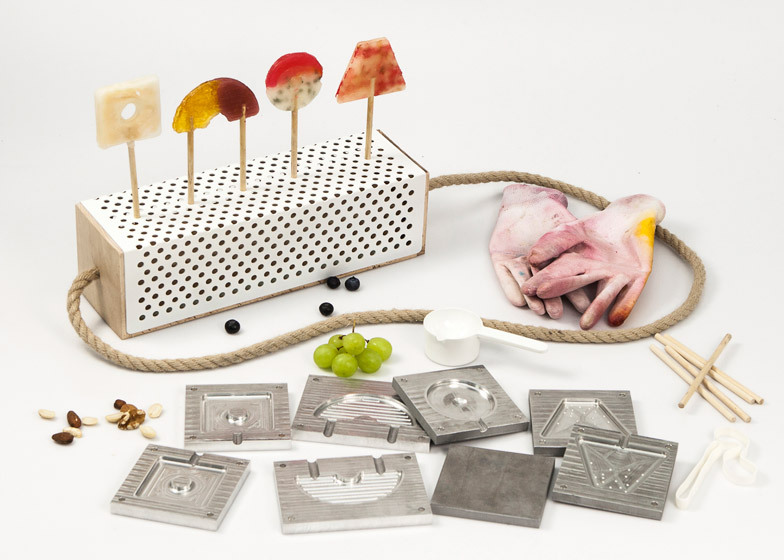 Geuze's Something Sweet kit comprises the components required for a miniature sweet factory including aluminium lollipop moulds, scoops, heat-proof mitts and a display stand that also serves as a storage box to house the utensils. Geuze set about producing the kit as a way to pare down the lengthy lists of unrecognisable ingredients often included in shop-bought sweets. "With Something Sweet I have tried to challenge our relationship with candy, which used to be a luxurious treat," Geuze told Dezeen. "Instead of using big machinery to produce candies with artificial colours and flavours, I tried to bring the appreciation for our treats back," she added. 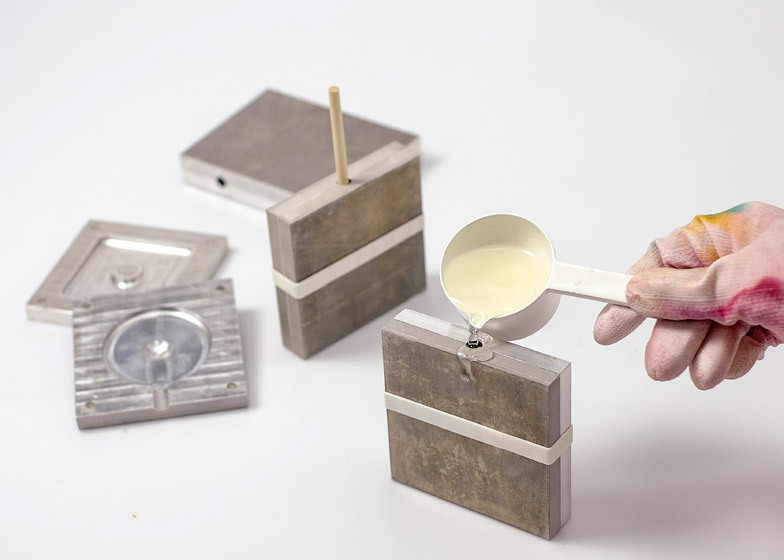 Homemade sugar syrups can be decanted into a scoop matching the mould capacity, then poured into the metal shapes while wearing the heat-resistant gloves. The moulds are made from CNC-milled aluminium and have ridges designed to hold the two halves together during the setting process. Geuze also came up with Swedish favour combinations designed to correspond with the seasons – ingredients that can be foraged for in the local area and change throughout the year, because "candy tastes better when you know where it comes from". 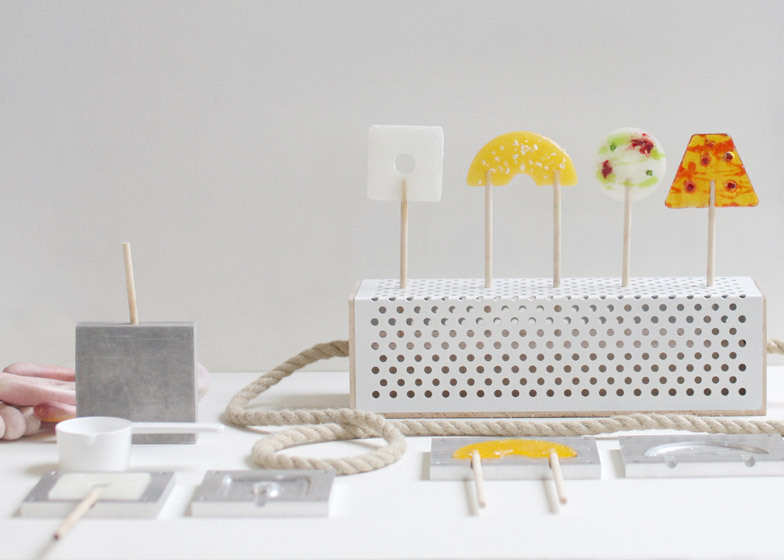 "The lollipops are based on the different seasons in terms of taste, colour, shape and structure," she said. "I have tried to communicate the sharpness of the winter, the roundness of the summer and the transition between these seasons with the different forms." A circular mould intended to represent summer is used with a fresh raspberry and mint mixture, while a snowy-coloured syrup flavoured with meringue and caramel is poured into a square mould that characterises winter. Transitional seasons – spring and autumn – are represented by a combination of curved and skewed edges. A lingonberry and sea-salt concoction was devised for a trapezium-shaped mould for autumn, while a rainbow-shaped mould symbolising springtime produces a double-handled lollipop that Geuze believes is best filled with a combination of honey and roasted almond. The components pack down into a compartment in the base of the lollipop stand. 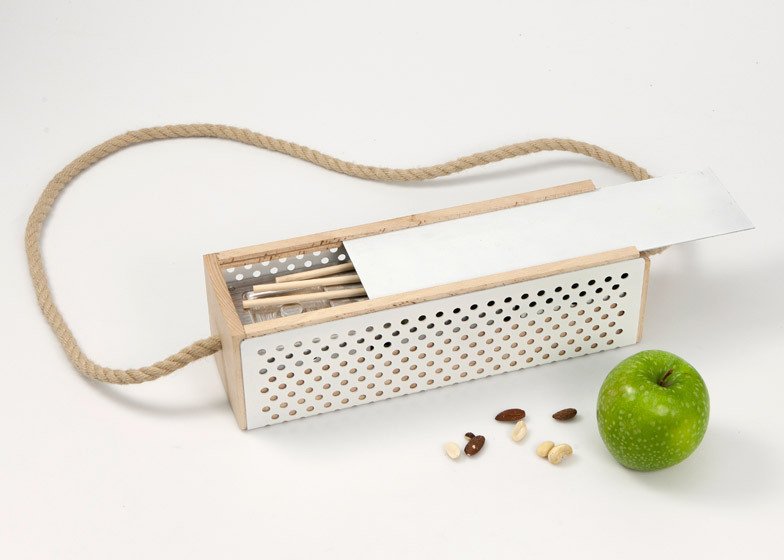 The moulds and cooking utensils can be stowed away in an ash-wood drawer in the base of the perforated aluminium lollipop holder. 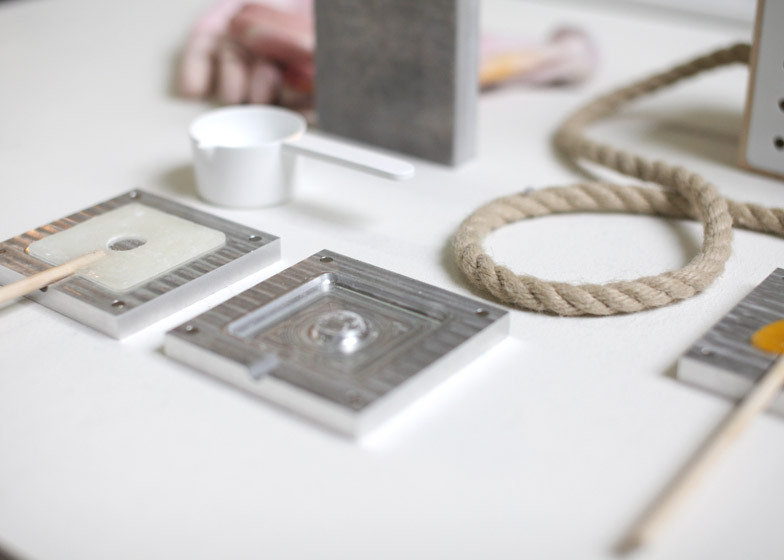 The whole kit can be carried using a rope handle affixed to either end of the box. The project was presented in Milan's Ventura Lambrate design district last month, where Geuze's Lund University colleague Britt Jönsson was one of a number of designers presenting scent-related projects around the city.